Ellen started her career in the world of stand-up comedy. She blended the awkward delivery of a Bob Newhart and Woody Allen with the quirkiness of Steve Martin. She began her journey at small coffeehouses and clubs and by 1981 had become the emcee of Clyde’s Comedy Club in New Orleans. Five years later, she would be seated on the couch of the Tonight Show with Johnny Carson. Her career would take off from there and by 1994, she had her own television show, Ellen. The show would reach its most popular moment in 1997 when Ellen publically announced she was gay. It was a brave move at the time, but the network was treading over uncharted waters when it came to public opinion. Her show was cancelled the next season due to a change in tone of the series. The once funny sit-com had completely taken on a new and serious theme. The next few years became a bit of a challenge as Ellen struggled to find consistent work. She briefly starred on another television show called, The Ellen Show, which only lasted 18 episodes. Luckily for Ellen, two of the biggest opportunities of her life were right around the corner. In 2003, the Pixar film, Finding Nemo was released in theaters and quickly became a huge hit. The biggest reason for the films success was the incredible vocal performance of Degeneres as Dori. Her win of the Saturn Award marked the first and only time the Academy of Science Fiction, Fantasy & Horror Films has given the acting award for a voice performance. This same year, she also became the host of her own talk show, Ellen: The Ellen Degeneres Show. She became wildly popular again as more and more people tuned in to watch her generosity and outrageous theatricals. The show is currently still running. She went on to host the Grammy Awards on two different occasions, the Emmy Awards twice and the Academy awards in 2007 and 2014. Her calm demeanor and witty repertoire makes her an ever-increasingly popular host for big awards shows. Her most recent hosting of the 86th Annual Academy Awards was watched by 43 million viewers, the largest audience in 10 years and up 6% from last year’s telecast. 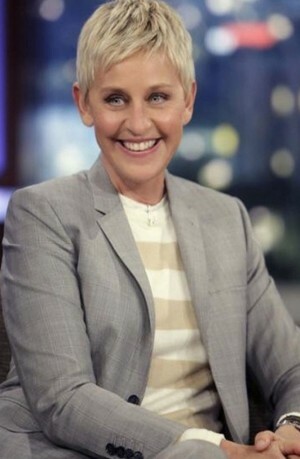 Ellen DeGeneres supports numerous organizations, and has won many awards for her charitable efforts. Recently, DeGeneres learned about an organization called The Gentle Barn, a home and hospital for animals that have been abused. On her website, DeGeneres urges her viewers to donate. With Ben Affleck, DeGeneres launched the “Small Change Campaign” to benefit Feeding America. Ellen supports the Hurricane Katrina Relief Fund through the American Red Cross. She recently donated $10,000 to Paul Walker’s Charity and gave a single mom and waitress a check for $10,000 on her talk show for the waitress’s kindness towards servicewomen. Other charities include It Gets Better Project, Humane Society, The Trevor Project, Music Rising, Red Cross, Declare Yourself, and the ONE Campaign.